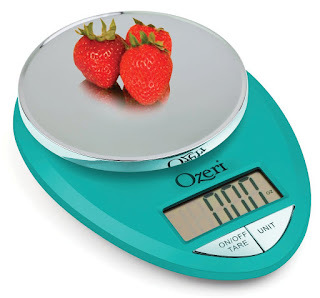 Ozeri Pro Digital Kitchen Scale Teal Blue is accurate and easy to use and weight up to 12 pounds. Features 2 large buttons that generate audible click confirmations, precision tare button calculates the bet weight of the ingredients, automatic unit button instantly converts from ounces to grams, pounds to kilograms. Has a large LCD screen is wide and bright with angle viewing for the on-the-go cook. Oversized weighing platform finished in elegant chrome. 3-minute automatic power-off preserves battery life. Compact design and requires 2 AAA batteries to run. My Opinion: I really like the color of this digital kitchen scale is am tired of the same old boring colors of silver or black. I also like the book that came with it is a calorie guide so you know what you’re eating and how much to intake if you following a diet. Found it easy to use and to measure the food that I wanted to see the weight of.